Himachal Pradesh is the one of the culturally rich state In India. Here people of many cultures live . But the Traditional Himachal Culture is the main culture of Himachal Pardesh. Most commonly spoken languages in Himachal are Hindi , Punjabi, Pahari, Dogri, Mandeali, Kangri and Kinnauri. Himachal have tribal population which mainly comprises of Gaddis, Kinnars, Pangawals and Lahulis. Near About 96% population of the state is Hindus. In Himachal major communities are Brahmins, Rajputs, Choudharies, Kannets, Rathis and Kolis. Himachal is also known for its handicrafts work. The carpets, leather works, shawls, paintings, metalware, woodwork and paintings are made in Himachal. One of the products which is highly in demand not only in Himachal but all over the country is Pashmina shawl. Himachali caps are also famous In all over the India. Dance and Local music shows the cultural identity of the Himachal Pardesh. Through their dance and music, they pay tributes to their gods during local festivals and other special occasions like marriage, birthday etc..There are many of fairs and festivals that are of great significance to Himachal Pradesh like International Shivratri fair at Mandi and international Kullu dussehra ,lavi mela at Rampur, Minjar fair at chamba etc. Our NGO try to protect The Himachal Culture by organizing camps in different-different places. We organize camps to aware the Himachali people to protect our Himachali Culture because of the advent of western culture , our Himachali traditional culture is slowly dying. 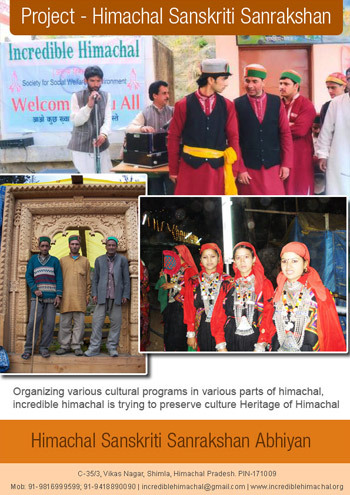 Our NGO Incredible Himachal Do lot of work to save our Himachali Culture and we try to Continue to do work on our Himachali Culture.